Hours: 4 days / week. Some unsociable hours may be required. If you are interested in this opportunity, please review the job description. 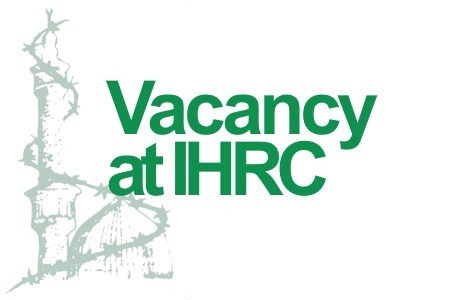 Applicants should provide a CV with a covering letter briefly outlining why they want to work for IHRC and showing how you meet the essential criteria and main purposes of the job to nargess@moballeghi.com and cc huda@ihrc.org. If shortlisted, applicants will be asked to provide at least two full references. We are looking for a motivated and independent person to work with our freelance executive producer and project manager. It will initially be for a 6 month period with a review at 3 months. It’s 4 days a week, based at our office in NW London. Tasks include filming and editing of a short 2 min video (just a single person to camera) each week and then other edit, research and assistant producer tasks, such as researching topics, calling/booking guests etc. as allocated. There may be opportunities to assist on filming shoots from time-to-time. The project lead will not always be present, so this role requires someone who can manage their own workload and maintain deadlines independently. The filming is with a provided canon m3 dslr. Editing can be done on fcpx or premier. If you are self-taught but have the required competencies please do apply. Islamic Human Rights Commission (IHRC), is a not for profit campaign, research and advocacy organisation founded in 1997. It is constituted as a company (no. 04716690) with a charitable arm (Islamic Human Rights Commission Trust, registered in the UK, no. 1106120). IHRC has consultative status with the United Nations Economic and Social Council.